It's been four years since President Bush strutted across the U.S.S. Abraham Lincoln to declare an end to major combat operations in Iraq. 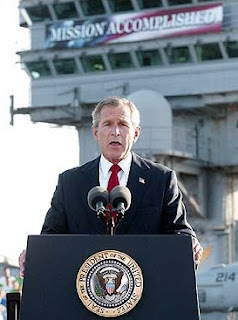 If he had had the good sense to start pulling troops out of Iraq at that point he would probably be a very popular president today and Republicans would still control both branches of Congress. But he stubbornly decided to press on with the most definitely unaccomplished mission and is now four years later he is preparing to veto a $124 billion funding bill because it includes non-binding language setting up a timetable to begin withdrawing troops in another year. Bush passed up many more opportunities when he could have declared victory and gone home to the point where we are mired in a no-win situation that is hopelessly spiraling more and more out of control. U.S. casualties in April were the highest for 2007 and I'm afraid they won't be the highest for the year. Meanwhile, our economy is beginning to buckly under the dead weight of so much deficit spending and our military has been stretched far past its limits. Recently it was reported that the U.S. chose not to confront China over a recent anti-satellite missile launch because we knew we couldn't back up our threats with our military mired in Iraq. Have I mentioned before that Bush is the worst president ever? ThinkProgress has an excellent chart showing the "progress" in Iraq since Bush declared Mission Accomplished. A government commission in Israel has issued a report that is highly critical of Prime Minister Ehud Olmert for his retaliatory invasion of Lebanon last year. A government commission that probed Israel's summer war against Hezbollah guerrillas in Lebanon accused Prime Minister Ehud Olmert on Monday of "severe failure," saying he hastily led the country into the conflict without a plan. A copy of the report obtained by The Associated Press cited a "severe failure in the lack of judgment, responsibility and caution." Wow! That sounds awfully familiar. Do you suppose Olmert was following the Bush administration’s playbook a little too closely? It’s refreshing to see that people in Israel are just as critical of Olmert as I was. It could not be more painfully obvious after reading this NYTimes story that we are just wasting our money in Iraq. Officials at the oversight agency, the Office of the Special Inspector General for Iraq Reconstruction, said they had made an effort to sample different regions and various types of projects, but that they were constrained from taking a true random sample in part because many projects were in areas too unsafe to visit. So, they said, the initial set of eight projects — which cost a total of about $150 million — cannot be seen as a true statistical measure of the thousands of projects in the roughly $30 billion American rebuilding program. I would imagine that the projects in the areas now deemed "too unsafe to visit" are probably not faring much better and most likely are doing far worse. most of the problems seemed unrelated to sabotage stemming from Iraq’s parlous security emsituation, but instead were the product of poor initial construction, petty looting, a lack of any maintenance and simple neglect. And we can't even blame the problems on the terrorists. Apparently it is just plain old incompetence - a hallmark of the Bush presidency - that is at fault here.